Yesterday the 2nd edition of the Wine and Culinary Forum was held in Barcelona. I was here to give a talk on minerality in wine, and I’m happy to send anyone who’s interested a written version of my paper. It was a varied and packed program, and with the exception of my talk, the rest of the presentations were focusing on the interface between wine and food, and how they work together. I can’t begin to sum up the entire content of the forum, but over the next couple of blog posts I’ll share are selected highlights. I enjoyed the presentation by Lucas Paya and Ray Isle on innovative ways to serve wine in restaurants. Paya has worked for a while as wine director for Jose Andres’ TFG (Think Food Group) restaurants in the USA. He’s used Coravin to serve wines, but with very expensive wines it’s important to be fair to the clients in how much wine is dispensed. So the wine is on the list offered/priced by the milliliter, dispensing it on a set of scales using weight as a surrogate measure of volume. There’s a minimum 30 ml pour. 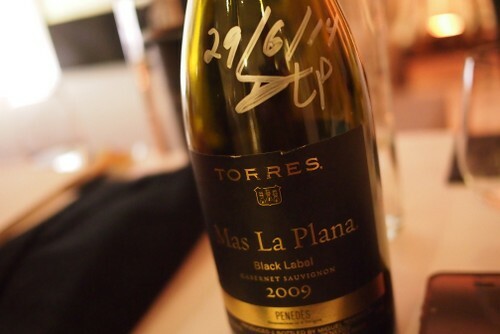 We tasted the Torres Mas La Plana 2009 which had been ‘coravined’ (neologism alert) on the 29th June by Paya in the USA. As you’d expect, it was very fresh, even with a huge below-shoulder ullage. Paya also talked about the wine list at Jose Andres’ Jalea in Las Vegas. Here the paper list has been replaced by iPads, which enables them to offer the customer a much richer set of information about the wine, and also makes navigating the list a lot easier. He added a concept called roulette (it’s Vegas), where you enter the table size (in people, not inches) and then play. If you don’t like the options suggested (with per head price indicated) you can play again. Another Paya theme is ‘old is new’. He includes how to drink from a Porron flask as a video on the wine list, and these Porrons have now become so popular he’s had to produce a plastic version for people to take away with them. Other ‘old’ innovations that have succeeded are port tongs and sabres. Paya also introduced the ‘bigger is better’ concept, bottling 18 litre melchiors of Virginia wine from the cask. This is the best selling wine at the America Eats restaurant (you don’t order the full Melchior, just a litre from the bottle). Isle also had some interesting things to say. One of these is the concept of flat priced wines. This works quite well for a casual/mid-range restaurant, who might decide to offer all the wines on the list at, say, $50. This defuses the pressure that a customer faces in looking at a wine list where typically there’s a big range of prices. Isle mentioned the innovative list at Husk in Charleston, South Carolina. Here the list is broken down into slate, alluvial, limestone and volcanic. It’s a clever approach that also plays into the sensibilities of the restaurant. He also cited the success achieved by Paul Grieco at Terroir Wine Bar in making Riesling popular. Grieco devoted a page of his list to Riesling every summer, an initiative that spawned the summer of Riesling movement. In addition, Grieco uses happy hour to promote niche but worth wines such as sherry and madeira. A nice innovation is the flow chart wine list.This givee a decision path that is fun, and draws the non-geeky people to something that they’ like, promoting engagement with the wine list that you otherwise wouldn’t see. Finally, Isle reported on the growing trend towards cask wines. Apparently younger drinkers in the USA love ordering a glass from a cask and this trend is growing very fast. Sounds like a very interesting forum (and I would like to read your presentation, if that’s possible). Do you happen to know which UK restaurants are using a Coravin? I’m intrigued to see where and how this would work. Who (outside Mayfair)is bold enough to gamble their bottle sales of very expensive stock? If you start ‘Coravinning’ (!) those ’82 Clarets, it could get messy! I know you can soon soak up the costs (£270 + £16 for each twin pack of 15-use canisters – Harrods) with high-end by-the-glass margins but it seems to me, more like a wine shop proposition, to replace Enomatics (albeit, more labour-intensive). It’s always interesting to read about the presentations at these types of forums, thanks for the posts. I’d also like to read your presentation when you have a chance.